me too, but not a big issue. I can't seem to find the quiz anywhere. Is it a random thing or what? somewhat random. after X number of fight, it ask you a mathematic question. I raided more than 20 times to get 2000 lumber.....Now,all opponents are fake,with level 5 and more than 100k of power.Very poor that feature. if ucool want to stop raiding, simply burn your resources + play slow = less headache. Yes,you are right.It is not worth the time spent to get so few resources. Anyone knows what will happen if you select the incorrect answer? Yes.You will need 20 more battles for the following question.It is recomrndable to answer correctly hehe. 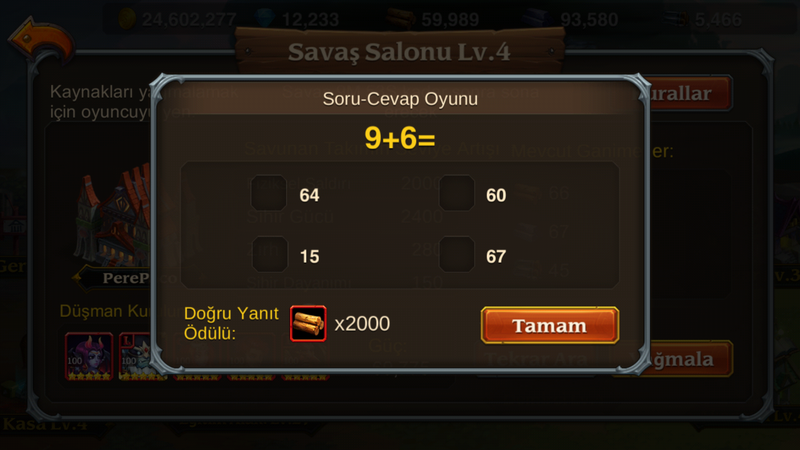 how much gold chest gives? How do you gets these chests? i have all the time bronze chest and sometimes Silver or gold chest.